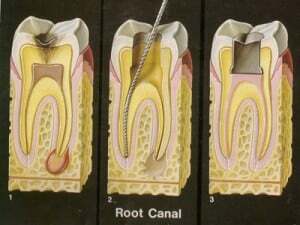 Endodontic procedures, also called root canals, are procedures designed to save a damaged tooth. If successful, the treated tooth, which was often very painful before treatment, will not cause pain and can last a lifetime. Endodontic procedures, though popularly represented as painful, are not generally very bad, and are much preferable to the pain of living with a compromised tooth. Your tooth is made up of three layers: strong, hard enamel surrounds tough, supportive dentin, which surrounds the tooth nerve. When bacteria attack your teeth, they can penetrate the outer layers of your teeth and eventually reach the tooth nerve inside. This can lead to extreme pain for you, and once your tooth nerve chamber has been reached, bacteria can travel through the root canal of the tooth to attack your jawbone. They can travel through the jawbone to attack other teeth, leading to multiple tooth loss, and damage to your jawbone may be difficult, if not impossible to reverse. In a root canal procedure, the damaged pulp or nerve is removed. The nerve chamber is then sterilized, and the tooth is filled with materials that prevent re-infection. Finally, the tooth is covered with a highly protective dental crown. Dental implants and other restoration options have their benefits, but in most cases if your tooth can be saved with a root canal, this is the best option. If you have a tooth that you feel might need a root canal, the sooner you act, the better. To discuss your treatment options with Cherry Creek general dentist Dr. Jeff Johnston, please contact Ascent Dental today for an appointment.